On 21st May 2016 the traditional “Festival of Freedom” was held in the Moscow Andrei Sakharov Museum and Public Centre. As part of this, two anniversaries were marked at the same time. First of all, it was the 95th birthday of Andrei Dmitrievich Sakharov - scientist, dissident, humanist, and 1975 Nobel Prize winner. Secondly, it’s 20 years since the Sakharov Centre was opened. For the occasion, the Sakharov Centre’s staff and volunteers prepared a programme including discussions on topical themes, film screenings, musical performances, master classes for children, and many other things. The nearby public square was decorated with white balloons with the slogan “Freedom!” Those wishing to support the Sakharov Centre in a financial way can buy a variety of the Centre’s souvenirs. But I daresay the central event of the opening of the exhibition in Sakharov’s honour, timed to coincide with the very day of Andrei Dmitrievich’s 95th birthday. 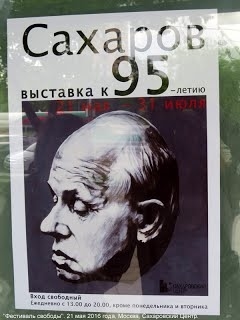 As Bella Koval, the director of the Andrei Sakharov archive, explained, this vast exhibition covers the three main stages of his life: his work on the Soviet Union’s nuclear programme; his participation in the human rights movement; and his activity in his capacity as a USSR people’s deputy. There are documents on show at the exhibition, including those from the “Special File” under the classification of “Top Secret”, photographs, publications – both written by Andrei Dmitrievich and about him. There is a reconstruction of his office, and you can hear audio recordings of his public speeches. Director of the Sakharov Centre, Sergei Lukashevsky said that the ideas and ideals of Andrei Dmitrievich have entered our lives. Meanwhile, the president of the Andrei Sakharov Foundation, Sergei Kovalev added that we must make great efforts not to distort these ideas and ideals, and to develop a keener sense of Sakharov’s way of life. “We should see this, we should know this and pass it on to our own children and grandchildren,” said Mikhail Fedotov, chair of the Presidential Human Rights Council. “He was a member of the parliament, he was never a politician. Politics is the art of the possible but human rights is the art of the impossible,” Mikhail Fedotov said. Sakharov’s former colleague, theoretical physicist and member of the Russian Academy of Sciences, Aleksandr Gurevich shared personal memories about Andrei Sakharov. “He was a highly original person – both in his thinking, as well as in his scientific approach. He was a particularly complete and independent personality,” Gurevich said. “In Sakharov there was a special something that commanded and maintained respect,” he added. The exhibition about Sakharov will run until 31 July 2016, from 13:00 to 20:00 every day except Mondays and Tuesdays. Entrance is free.